President Obama announces that U.S. forces in Iraq have, for lack of a better word, "won" the war. 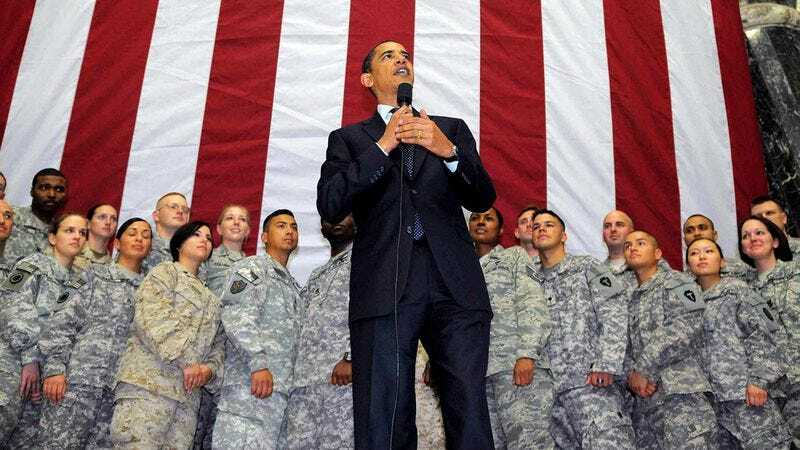 CAMP SPRINGS, MD—Addressing troops at Andrews Air Force Base Tuesday, President Barack Obama claimed victory in Iraq, saying that formal combat operations in the region would end Aug. 31, and that the United States had emerged from the seven-year war triumphant, kind of. "For nearly a decade, our mission in Iraq has been to root out those who would choose violence over peace, to create a stable Iraqi government, and to transfer power to an incorruptible civilian police force," Obama said. "And, in a manner of speaking, we sort of did some of that, right? More or less?" "Granted, this is not the definitive, World War II–like victory most of us expected," Obama continued. "But there's a military triumph in there somewhere, I swear. You just have to look at it from the right angles." The aftermath of what the president is calling "a success, in a sense, although not really in a traditional sense, per se." According to the president, the relative victory could be credited to a number of achieved benchmarks, depending upon how strict one's definition of "achieved" is. Obama pointed to the democratic election of an Iraqi parliament currently being held together by a thread; the streets of Iraq being slightly less hellish than they were in 2006; and the fact that women are now, for the most part, free to move around the country so long as they don't make a big production out of it. Obama also noted that during the war more Iraqi insurgents died than American troops, which, he admitted, isn't necessarily the best way to determine a war's victor, but is nonetheless still preferable to the other way around. "By the end of this month, victory, to a certain extent, will be ours, and we can finally welcome our troops back home," Obama concluded. "That is unless they are one of the 50,000 U.S. soldiers who will have to stay in the region for the foreseeable future." Following the president's address, a car bomb ripped through an outdoor market in Baghdad killing eight Iraqis and wounding 32. Pentagon officials also declared the mission, in a sense, kind of sort of accomplished Tuesday, citing the handful of Iraqi hearts and minds that may have been won over by the U.S. occupancy, and the fact that Iraqi prime minister Nouri al-Maliki had not yet been assassinated. "In cases where we were unable to rebuild infrastructure or quell violent civil unrest, it wasn't for lack of trying," Gen. Ray Odierno, commander of U.S. forces in Iraq, said during last Sunday's taping of ABC's This Week. "And trying your best, one could argue, is technically a triumph in and of itself." "And hey, Saddam Hussein isn't in power anymore," Odierno continued. "So that's something." With the cessation of combat operations, and the declaration of what sources said couldn't be called a complete and utter failure because to do so would be to admit that the U.S. wasted $750 billion, lost 4,400 troops, and killed 100,000 Iraqi civilians for absolutely nothing, both Democrats and Republicans have attempted to take credit for the quasi-victory. "President Obama deserves zero praise for this borderline accomplishment," Sen. John McCain (R-AZ) told reporters. "After all, if it weren't for President Bush ordering the initial invasion of Iraq and making it his central foreign policy initiative, we wouldn't be here right now awkwardly celebrating the muddled outcome of whatever the hell it is we've been doing over there for the past seven years." Pentagon and White House sources said the American people should expect more wince-inducing victory-if-you-can-call-it-that celebrations 10 or 15 years from now when we kind of, but not really, win in Afghanistan.